As with the lemon that studs them, these loaves are one of those breads I thought would be one thing, but of its own accord (with maybe a little bit of gentle and experimental nudging from me) it turned out to be another thing. Sometimes it’s fun to just let things unfold and see where you end up. The thing I thought it would be was gibassier, a French olive oil brioche traditional during the Advent season, scented with oranges and anise seed, shaped in flat round loaves. 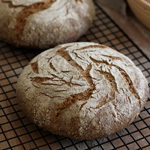 It is an amazingly good bread, and ranks among favorite sweet breads for nearly everyone I know who has tasted it. But thanks to my generous crop of lemons just now, my bread asked for candied lemon peel rather than orange. Because I had lots of lemon syrup as a byproduct of the candying of the lemon peels — and also because I was out of orange blossom water — the bread wanted the syrup to stand in for both the sugar and the orange water in a traditional gibassier recipe. Because I love putting candied ginger in things, this bread begged to be loved that way too. And the shaping was just me playing around to see what showed up, and perhaps longing for the December snow(flakes) I used to know in Vermont but rarely see anymore. 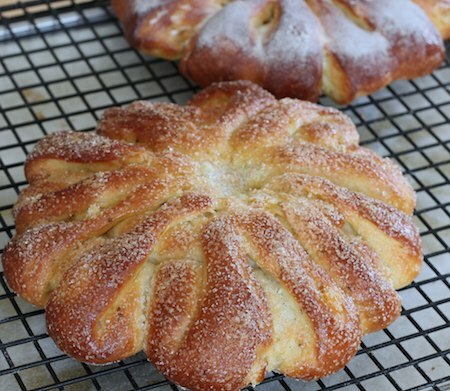 The result turned out to be something slightly less sweet and less citrus-y than gibassier, and a fine way to enjoy a delicately-flavored sweet bread with your morning coffee or tea. The ginger is very subtle, and I might add more next time. And I thought, Hm, only three ingredients. Aren’t there supposed to be four? Apparently I have come to take flour completely for granted. Like air. Paper Chef is a creative challenge where the month’s host draws three ingredients at random from a collectively-compiled list and adds a fourth of his or her choosing. I haven’t participated often, since the list is apt to include ingredients like salmon or liver, which don’t particularly lend themselves to bread. But this month, I couldn’t resist the combination of fruits that turned up in the lottery. Yes, they’re Beautiful, Bold, and Brilliant. But who knew that the Bread Baking Babes, whose monthly exploits take them into the far-reaching corners of the global oven, were also Beastly, Brutal, and just plain Bad? That’s the only conclusion I’m left with after undertaking my first bread as a newly-inaugurated Babe. Consider me duly hazed. Here’s the thing: this bread contains no flour. 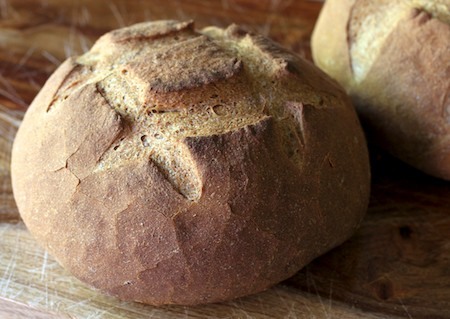 When you bake bread with flour, the miller has done a lot of work on your behalf. She has selected the right wheat berries at just the right stage of development, tempered the flour for the proper moisture content, and maybe added malt so the dough will ferment at the right rate. When you bake with no flour, you’re kind of on your own. Gee, thanks, Babes! Love you too. Do I now have to streak across campus in order to be fully ordained into Babehood? The procedure goes something like this: You don your Birkenstocks. You sprout some wheat berries. You whirl them up in the food processor with some yeast, salt and honey, and work it by hand a little to make a pretty nice dough. You let it rise a few times and bake it in a pan. 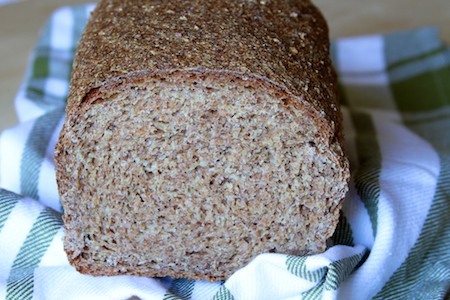 You get a heavy, dense, gummy-in-the-middle but crumbly-at-the edges, whole-wheat loaf that transports you back some [mumble mumble] years to your college co-op days when everyone wanted to volunteer for weekly bread-baking because it beat toilet-cleaning, but no one really knew how to do it. But here’s the other thing: it’s really not half-bad, considering the no-flour thing. 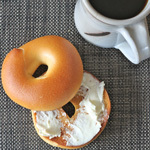 I always feel a little presumptuous posting about regional breads, especially ones that are new to me. On the other hand, limiting myself to writing about breads that I’ve known intimately since childhood would mean an entire blog about Pepperidge Farm White Sandwich and Dutch Dill breads, and that might get old fast. I hope it’s understood that most of what I write here about new breads comes from what I can glean from travels with my virtual surfboard and a fairly good sampling of bread books like these. I also hope it’s understood that I welcome anyone who has any firsthand knowledge of these things to correct, expand upon, or otherwise edit my neophytic commentary. I particularly invite my Italian friends to chime in on this one. Schiacciata is a Tuscan flatbread, similar to — or is it a type of, or another name for? 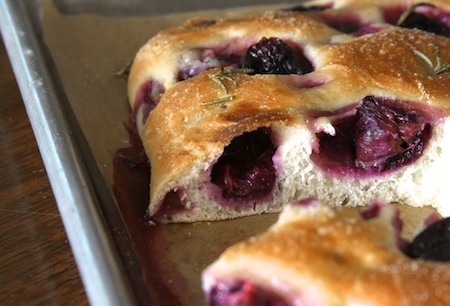 — focaccia. Schiacciata is pronounced something like skya-CHA-ta, and means “crushed” or “squashed” in Italian. Schiacciata can be plain or filled with fruit, vegetables, meat, or cheese. 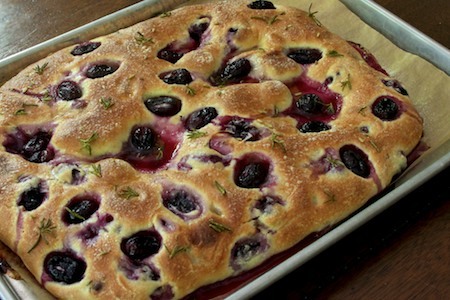 Grape schiacciata (schiacciata con l’uva) is a traditional version that celebrates the Tuscan grape harvest. It typically uses wine grapes (with seeds). I used seedless black grapes. 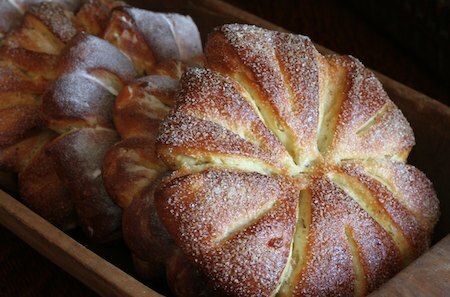 Schiacciata can be made as a rich, sweet pastry with eggs and lard, or as a rather lean dough. The one I made contains just a little sugar and olive oil in the dough, and a little more on top. 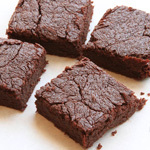 Anise seed is not an uncommon addition to sweeter versions of schiacciata. Fennel seed, which I used, seems to be less common but not unheard of. 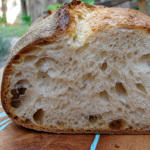 I did not find semolina to be an ingredient in any of the schiacciata recipes I looked at. 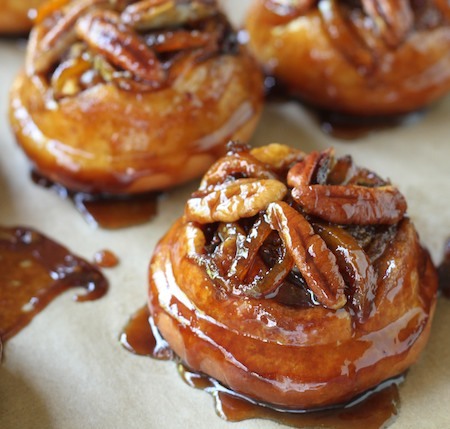 I included some in mine because I like the hint of golden color and nutty flavor it adds to dough, and because I’m wild like that.